I have long been leery of the general term "enhancement medicine" to describe what are now (and will soon be in even more powerful forms) therapeutic practices of genetic, prosthetic, and cognitive modification. I'm unhappy with the term because as a general designation of emerging therapeutic possibilities "enhancement" seems to me to imply a kind of prior agreement as to what an "enhancement" consists of in the first place, when in fact any "enhancement" is always enhancement: to whom? arising from what initial condition? achieved by what means and in what social circumstances? in the service of what ends? and so on. There is a deep diversity of actually existing viable human morphologies and lifeways in the world. And modification medicine will (or certainly it should) expand rather than contract that diversity. "Enhancement," on the contrary, seems to conjure up the image of consensus where no consensus can or should be: It seems to me to imply the eerie tableau of "the race" in some imaginarily monolithic morphological construal all marching resolutely in the direction of some medically-mediated "optimality." But, of course, there is nothing like actual agreement on what such "optimality" would look or feel like, even if there is wide agreement about what basic health and viability consist of (a basic healthcare standard that, it bears mentioning, many millions of exploited, suffering human beings fail to enjoy here and now, through neglect and not necessity, while we are pondering optimalities achievable in principle via anticipated therapies). In any case, the contentious back and forth among prosperous people of competing conceptions of optimality looks to me like a debate that will continue on interminably (if we're lucky). Far from pretending we already know what human optimality consists of, or, worse, quixotically demanding we come to agreement on such optimality before we embark on personal paths of therapeutic self-creation, it seems to me we should realize that the proliferation of capacities, morphologies, and lifeways provoked by modification medicine -- any number of which will seem like "enhancements" only from the perspectives of those who opt for them -- will itself constitute the next turn in the ongoing conversation about optimality, the conversation of humanity with itself about what it means to be human and what is the good life proper to humanity so conceived. Reading an argument posted earlier today from an IEET colleague of mine, George Dvorsky, I really had occasion to return to these preoccupations in earnest. Dvorsky begins his discussion by thinking through the vexed relation between the implications of contemporary genomic therapy and historical eugenicism. "Eugenics. It is a word that has come to mean different things to different people. Some consider it a pejorative, while others use it as a powerful tool in political rhetoric. It conjures images of Nazi brutality and 20th century zealots working to sterilize the unfit. Ask anyone for a definition and you're bound to get a multitude of different answers; when you key define: eugenics into Google it spews out no less than 20 unique definitions." This framing seems to me to risk somewhat -- for reasons that remain unclear to me -- creating an impression of controversy where there isn't really much of any, in my opinion. My own sense (and I'll admit it is subjective and reflects my milieu) is that "eugenics" is a word that means broadly the same thing to almost everybody, and that it is almost universally and rightly reviled, not just because of the hideous Nazi associations that Dvorsky mentions but also associations with an unbelievable profusion of racist biomedical practices (check out Harriet Washington's extraordinary Medical Apartheid for more about this) in 20C America. And even if it is true that Google spews out twenty definitions of the term, it isn't really hard to distill a common denominator from them (pretty much in line with Dvorsky's own characterization, which I'll quote and discuss in a moment), and so this no more suggests "eugenics" is a vigorously disputatious term than the comparable number of definitions available for the term "grammar" suggests such a thing for it. Dvorsky continues: "When stripped of all its historical and social baggage, however, 'eugenics' can be used to describe two general philosophical tendencies: 1) the notion that human hereditary stock can and should be improved, and 2) that such changes should be enforced by the state (or other influential social groups such as cults or religions)." I'll admit that the phrase "human hereditary stock" is one that hardly seems to me to be "stripped of historical and social baggage." "Human stock"? And just how comfortable are people with even the more "liberally eugenic" attitude that one can speak of "the human race" as a "whole," and from there go on to suggest that this "race" can (should?) monolithically be "improved" through therapeutic intervention? I don't mean to ruin the detective story by flipping to the end of the book and announcing who dunnit, but isn't it right to point out that modification practices are likely to proliferate human capacities, morphologies, and lifeways -- and surely quite often in ways that will not seem to be improvements to anybody but those who opt for them? What sense is there in turning to generalizing formulations in the face of such individualizing formations? I agree with Dvorsky that what is most objectionable about historical eugenicism is that its prescriptions were implemented coercively by agents of states, and I agree with him that authoritarian non-state actors are also a worry (he mention cults and religions as examples, and certainly I would add multinational corporations to that rogue's gallery). But I think Dvorsky and likeminded others tend to underestimate somewhat the worry that overzealous undercritical professional characterizations of "optimal health" on the one hand and "substandard lives" on the other (which often get freighted with stealthy and even unconscious parochial prejudices about race, class, gender, "disability," and so on) can suffuse the community of medical practice or social service in a way that becomes very nearly as authoritative and edges just as worrisomely in the direction of the sort of coercion Dvorsky rightly abhors. "If the state sides with the neugenicists [a coinage Dvorsky uses to describe bioconservative positions for the most part] and bans the use of enhancement technologies, then it is enforcing a particular vision of humanity, albeit a fixed one. In this sense the neugenicists are similar to the authoritarian eugenicists of the past. In each case individual procreative freedoms have been trumped by the demands of the state (which, in a democracy, is supposedly the consensus opinion)." I don't agree at all with the quick characterization of democracy there at the end -- since I would argue that democratic formations attempt the nonviolent reconciliation of dissensus, not the imposition of consensus -- but that is a digression. I do agree with what I take to be the substance of what Dvorsky is saying here, and I do think this is probably a pretty controversial position for both of us to hold. But why should that be? It seems to me that this really amounts to a straightforward and literal anti-eugenics argument (and not just an analogy). Dvorsky is pointing out that bioconservatives want to intervene in healthcare to maintain their vision of "human optimality" (which they selectively identify with elements in the status quo that they often designate as "nature," or "God's will," or "dignity" in some retrograde Kassoid construal or what have you). In all cases eugenics involves the imposition on majorities of a minority moral viewpoint stealthed under cover of claims about optimal health for the "race" as a whole. Anti-eugenics is the repudiation of such medical moralizing, and usually by way of a preference for medical ethics. Rather than being inspired, as eugenicist attitudes are, by bigoted visions of "racial uplift," anti-eugenicist positions are inspired by bland visions of the scene of consensual healthcare decisions between informed patients and competent healthcare workers. Now, Dvorsky claims that those who are anti-eugenics (as I definitely and vociferously am myself) are forced into what seems to me a palpably false alternative between two ungainly neologisms of his: "dysgenicism" and "neugenicism." Against a eugenics (all liberalized and properly fumigated of its historical uglinesses) figured as "universal progress," Dvorsky proposes then that only the alternatives of universal regress and universal stasis remain on the table. But, you know, for me, the desired alternative to eugenicism is simply: consensual practices of healthcare. I suppose I just don't agree with the bioconservatives (or, apparently, with many of the "transhumanists") that modification medicine alters this basic vision of the possibility and desirablility of consensual healthcare in a democratic society. Certainly, I don't agree that modification medicine properly raises anew the need for the bad old rhetorics of "improving mankind" as a whole or fending off "racial decadence." Instead, I think modification medicine will provoke a proliferation of lifeways that make discourses of diversity, consent, and tolerance all the more urgent. I actually suspect that Dvorsky would agree with quite a lot of what I am saying here, as almost certainly he would agree with the spirit of it even if we disagree on particulars. That is why I find it so puzzling why he and so many other technocentric writers I respect sometimes seem so curiously keen to rehabilitate the eugenicist term in any sense in the first place. There remains an overconfident and overgeneral regulatory ideal of optimality at the heart of too many of these viewpoints, even when they repudiate coercive interventions in the name of that optimality. Likewise there remains in too many expressions of these viewpoints a trivialization of the horrors that took place in the name of eugenic rationality, despite the quick and inevitable genuflections that tend to frame these formulations. Defending eugenics seems to me rather tone-deaf as a rhetorical strategy for defending consensual modification medicine from bioconservative bigots. I think an uncompromising attack on eugenics is surely what is wanted, both from an ethical and a practical standpoint. Whether in its 20C form as the bigoted authoritarian horror show of state-sanctioned coercive medical intervention in the name of "racial uplift" or in its 21C form as the bigoted bioconservative horror show of coercive deprivation of access to wanted life-saving and lifeway-promoting therapies in the name of "preserving the race," eugenics is a moralizing and anti-democratic travesty of consensual healthcare. Dvorsky concludes his piece by asking: "And what is it exactly that we are trying to accomplish vis-a-vis enhancement? It is the fostering of lives that can flourish, self-actualize, and meet their greatest potentials, while ensuring that they are free from as much suffering and undue constraints as is possible." I will admit that I am indeed quite skeptical in the presence of general pronouncements about fostering "lives that can flourish" because I think there are more ways of flourishing than are ever readily intelligible from any one parochial perspective (emphatically including my own). I worry enormously about the promulgation of healthcare standards that urge "intervention" not only to ensure people are free from suffering but, beyond that, foster "greatest potentials" and eliminate "undue constraints" to those potentials. I think that individual consent, parental prerogative, and diversity as a public good all have to trump any activist interventionism inspired by visions of optimality, else it is too easy to drift, however well-intentioned one is, back into the defense of some pretty old fashioned 20C eugenicism. To admit to this worry is hardly the same thing as defending a regressive luddism or celebration of the status quo. Heck, I just think I am advocating consensual healthcare practices in a rhetoric that is already incredibly legible and widely affirmed in the relatively democratic North Atlantic societies where Dvorsky and I both happen to reside. I think technoprogressive advocates of some genetic, prosthetic, and cognitive therapies are better served with a rhetoric of consensual modification over generalized "enhancement," a rhetoric emphasizing informed, nonduressed consent rather than fantasies of some regulatory consensus about "human optimality," and healthcare as prosthetic self-determination rather than eugenics in any construal. I worry enormously about the promulgation of healthcare standards that urge "intervention" not only to ensure people are free from suffering but, beyond that, foster "greatest potentials" and eliminate "undue constraints" to those potentials. So do I. The part that bothers me about some of the arguments I come across in the writing of persons with whom I actually agree with on many tokens is the implicit question of what, exactly, comprises an "undue constraint", and the other implicit question of who gets to decide the nature of another person (actual or potential) truly is. I don't think that states or corporations (or market forces, for that matter) should ever be able to impose some idea of what they think "full potential" is on individuals. Of course there are some boundary conditions here (e.g., I am not arguing that alcoholics shouldn't receive treatment or that people shouldn't try to see about remediating deadly or life-shortening or severely painful genetic conditions) but the gray, fuzzy area is vast and I think it should stay that way. People who want to democratize modification and the distribution of health resources and services do not serve this want by going along with the growing trend toward pathologizing every aspect of existence. It shouldn't be necessary to pathologize everything in order for someone to be able to seek some sort of modification, or not seek it. Living in society as it is presently structured, I have literally lost sleep over wondering if I've managed to do enough to "prove" myself (e.g., going to college and maintaining employment) so as to justify my continuing freedom to self-determine. I don't think I should have to feel that way, and that feeling is more "disabling" in many respects than any aspect of autism. Believe me, I know. 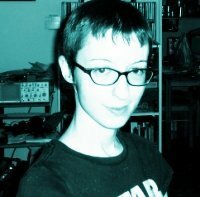 It's 2005, and despite all I've gone through and all I've done I am still to this day, humiliating though it is to admit it, still trying to prove I deserve to exist to the idiot kids who terrorized me in high school for being queer and being intellectual. And, damn right, you're right! You sure as hell shouldn't have to feel that way! Quite right: once the conditions for a legible scene of informed, nonduressed consent are met (actually, as the world is organized these conditions are rarely met for any but quite privileged people -- but one can still say: "to the extent that these conditions are met" and cover quite a lot of diversity), then we should leave matters of "full potential" and "optimality" and other essentially moral and esthetic assessments to the people themselves, engaged in paths of private perfection and prosthetic self-determination to manage for themselves. Likewise, so long as decisions parents and legal guardians make for their children and wards do not reasonably interfere with a preconsensual subject's eventual assumption of the responsibilities of the scene of consent or recklessly endanger, impair the basic health, or do violence to nonconsensual subjects, then -- once again -- matters of "full potential" and "optimality" should be left to the families and intimates directly involved with that scene of decision to determine as they determine from their privileged informational perspective the best interests of the child or ward. As you say, this is not to embrace a relativism that is insensitive to the awful vulnerabilies to abuse and violation and humiliation that the preconsensual and nonconsenual are unique subject to, not to deny the role of states in ensuring that these abuses and violations do not happen. But I find it weird how often a position that stresses consent over the imposition of parochial standards of "optimality" finds itself in the position of responding to such charges. Just because one is not a moralizing busybody doesn't mean one doesn't have the sense to know that it is a good public investment to make alcohol rehabilitation programs available to those who seek them out. What kind of fundamentalist ideology would impel people to mistake as "relativists" those who embrace a harm-reduction policy vocabulary rather than a coercive and stigmatizing authoritarian whomping up of moral panics with respect to risky drug use, less safe sexual conduct, licensing regimes for the ownership and use of cars, guns, complex machinery and so on, or the support of viable if unconventional morphologies and lifeways? This is reasonableness, not relativism. Of course, I concede that there are times when a person who apparently consents to an outcome doesn't really do so at all. A person can try to kill themselves not because they want to die but because they are crying for help. A person may demand to be wounded when they really want to come to terms with a devastating trauma. Admitting this is not to deny the fact that sometimes a person may perfectly reasonably want to die, may perfectly reasonably desire a modification that seems unintelligible to outsiders as anything but a "wound." Also, I always insist that consent must be informed and nonduressed, which means a scene of consent substantiated by access to reliable knowledge and robust social support (universal healthcare, basic income, lifelong educational recourse, and so on). But the obvious fact is that this substantiation does not obtain in the world as it is. Now, this is not an excuse either throw up our hands and "let the market decide" nor to infantilize everybody as incapable of consent. Rather one must carefully respect consent to the extent that it is informed and nonduressed, one must struggle to provide reliable information and support to ease duress and bolster consent, one must see to it that those who bear undue costs and risks from misinformed and duressed consent are retrospectively compensated so massively as to encourage respect for legible consent, and so on. All of this is to admit that consent is enormously complex -- and shows no sign of getting less so any time soon. I can easily see why people would want, in the face of these complexities, to embrace the soothing simplicities of tribal, subcultural, authoritarian, pious, faithful, reductive, moralizing outlooks that shunt the complexities to the side and tell us self-congratulatory fables instead. But I for one think that people as privileged as we are have, at minimum, a real responsibility to do better than that -- even if it introduces a measure of insecurity into our lives (an insecurity which, at worst, is a fraction of the precarity with which planetary majorities must contend at the hands of the bomb builders and statistians our simpleminded stories set upon the world in our names). Uh, 2007. Where's my head at? Is It Naive to Side With Democracy?